Great condition. Worn once or twice. There is and black scuff mark on the left Pump. Michael Antonio Womens Laila Red Platform Pumps Heels Size 9 *New*. Condition is New with box. Shipped with USPS Priority Mail. While red high heels used to be seen as a little scandalous, they are now considered a fun way for a woman to spruce up her wardrobe on any occasion. High heel pumps are available at all price points in styles ranging from stiletto heels to kitten heels. Some styles are also available in narrow and wide sizes. What brands sell red high heels? Some high-end designers like Gucci and Prada frequently include red heels in their collections. 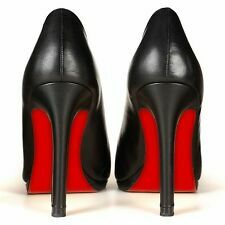 Christian Louboutin is famous for his red-bottomed heels. Almost all the popular mall and department store brands - including Franco Sarto, Naturalizer, Jessica Simpson, Vince Camuto, Betsey Johnson, and Aerosoles - consistently offer some of their women's pumps, boots, and booties in red. How do you pick the right pair of red heels? Basic style - The different types of heeled shoes include sandals, pumps, booties, and boots. Heel style - Women who are looking for heels to wear in conservative environments, or in environments where they have to be on their feet, may be interested in heels 3 inches and under. These women may also want a chunky heel or wedge heel. Women who want high heels for going out may be interested in dramatic shoes with higher heel heights, like platforms or stilettos. Toe style - Closed-toe shoes generally have either a rounded toe or a pointed toe. Peep-toe pumps and booties generally have a pointed look. Material - The type of material you choose will depend on where you want to wear your high heels. If you are looking for something to wear to work or while running errands, you will probably be interested in leather, faux-leather, or patent. If you are looking for dress pumps or sandals, you can consider material and finishes like satin, velvet, lace, and metallic. Prints and Embellishments - While solid red high heels are always a good choice, many women enjoy wearing red heels that incorporate contrasting colors like white or black. Other women enjoy studded heels, sequined heels, beaded heels, or red heels with prints or patterns. Straps - Some pumps and sandals have ankle straps, t-straps, or slingbacks. How can you make high heels more comfortable? If you are wearing closed-toe boots or booties, boot socks may provide some comfort. If you are wearing pumps or open-toed heels, there are special cushioned inserts that are designed to make them more comfortable. What do you wear red high heels with? Red high heels can be worn with just about anything. Some women like to wear their heels with denim or light colors like beige. This makes the red high heels stand out. Some women like to pair them with other red accessories like purses or scarves. 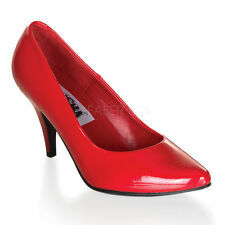 Some women like to wear red high heels with bold or dramatic clothing in colors like red or purple.